It seems as if there are almost as many eateries in Key West as there are local people who live here. Key West is the county seat of Monroe County and is often called “the end of the road,” as it is the last Key in the chain accessible by car. The close proximity to Cuba (only 90 air miles from Havana) makes Cuban cuisine a popular feature of the Key West dining experience. Chicken, yellow rice and black beans are almost a staple in this island city. But Cuban is not the only gastronomical influence. 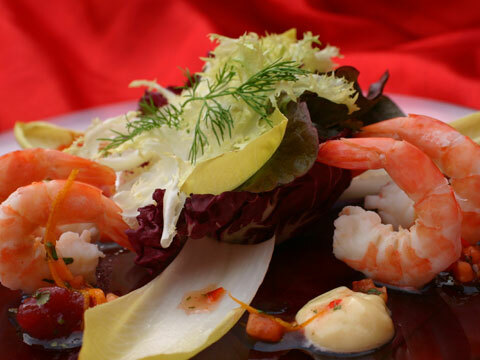 The famous Key West Pinks (shrimp) shown above, are served almost everywhere, in many variations, as well as other seafood – stone crab claws, lobster, Conch (konk) – are plentiful in season. There is wide variety of ethnical dining establishments in Key West. French croissants for breakfast, Conch fritters or chowders, Australian lamb, Italian pastas, Greek stuffed grape leaves, sushi or sashimi, spicy Jamaican dishes, Mexican enchiladas – all and more are available in the many eateries in Key West. Steaks and chops take no back seat, either, in the many grills and steakhouses located here. While dining is casual in most places, the large hotels and resorts all feature five-star restaurants. More than one Key West chef has been invited to the James Beard Foundation in New York to prepare his/her specialties for gourmet consumption by Foundation members. Indoors or al fresco, Key West dining is an experience you won’t forget – no matter what your preference.